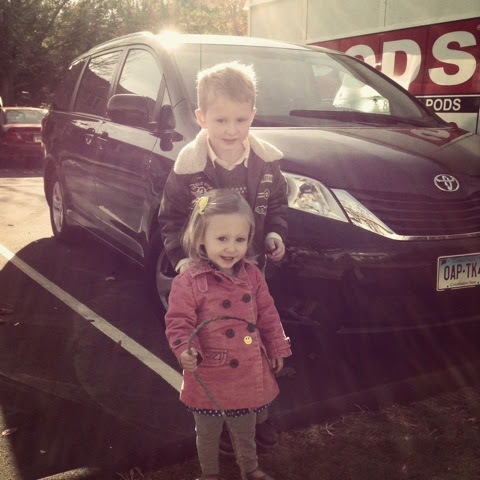 We bought a minivan last weekend! 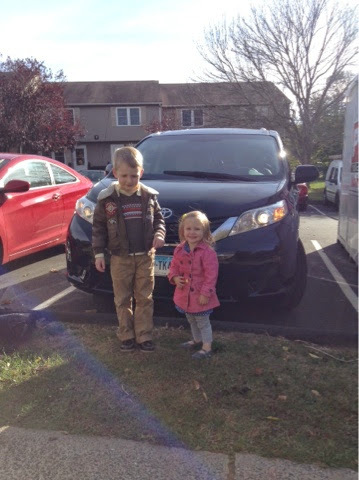 It is a black 2011 Toyota Sienna. After hemming and hawing (that's the phrase, right?) and driving Evan to work for two and a half years, we finally took the plunge. Over the past few months I've been casually watching online for a good deal on a fairly new, low-ish milage minivan. It seemed that one dealership frequently had the type I was looking for at the right price but that dealership had terrible reviews so I didn't want to risk buying from them. Eventually a dealership with great ratings had a minivan that was 3 to 5 thousand less than most comparible ones so we went to take a look. It was priced lower than the blue book dealer trade in value! It was such an easy car purchase! The dealership we went to was awesome. They have NO obnoxious sales people. They leave all their cars unlocked and let you go look at them by yourself. And they don't come along for the test drive either. In fact, they let you test drive it all day if you want to! Plus, they don't negotiate price so we didn't have to worry about haggling. And they have lots of good snacks. And an included 60 day warranty. Calvin LOVED car shopping. He was practically begging us to buy one. Especially with automatic sliding doors. Haha. Anyway, we signed to buy the car on Wednesday after getting the okay from our mechanic but the dealership had to fix a bunch of minor broken things and detail it so we actually bought it on Saturday. It was so easy! Our kids ate their snacks while we signed some papers, wrote the largest check I've ever written, then we drove home! I didn't actually drive it until Sunday- I trusted Evan to test drive it for us, but it is awesome! And shiny! It has grocery bag hooks in the back! And sliding doors! That you can open with the remote! And a back-up camera! And volume adjusters on the steering wheel! And fake leather seats so spills are easy to clean up! And room for 8 people! And the back seats collapse flat into the floor! I could go on and on. Calvin tells me every day that he loves our new car and he is so glad we bought a minivan. And he wishes he were allowed to go out and play in it. Haha! I only have thee regrets: One: It has 38,000 miles and I was hoping to buy something with less than 30,000 miles (but I feel like 3-5 grand was a good trade for 8,000 miles). Two: it doesn't get as good of gas milage as the Odyssey (Odyssey was my first choice). Three: it doesn't have a self-closing back door. I didn't even realize I wanted that until today though. Haha. But seriously, I'm so glad we bought a minivan instead of an SUV. Sliding doors are amazing with kids! The best part is our days of being at church for at least 6 hours straight are over! We can drive separately now! This is quite a fun-filled car-buying story! Your cute kids must have felt so giddy when trying those sliding doors! Just remind Calvin that cars aren't a play place, and everything should be fine. Have fun with your new car!